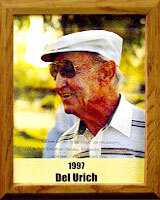 Del Urich was Mr. Golf for generations of Tucsonans. He was the first head pro at Randolph Golf Course for four decades and instrumental in the development of Randolph North, planting many of the trees himself. He also was a key player in the building of the South course, making clay models of the greens by hand. In 1992 he was inducted into the Sportsman’s Fund Ricki Rarick Hall of Fame. Del was a great humanitarian who devoted his life to golfers and their idiosyncrasies. More importantly, he often outdid social workers in aiding youngsters, doing it very quietly without seeking praise or notoriety. He won his first golf tournament in 1929, the San Diego County Amateur Championship. From then on he won enough tournaments to line the walls of a moderate size house with his trophies. Urich liked to recall the early days in golf out in the desert: “I can remember when we had to fight off rattlesnakes and Gila Monsters, and when I had to race out onto the course and chase the cattle away from the greens. Greens, did I say? They were oil and sand ‘greens’ over cottonseed. If I didn’t chase the cattle, they would eat away all the cottonseed.” Del died in January, 1995.